A true time saver with sample contracts, bids, letters, etc. With this go-to manual, your students will learn how to plan, implement, promote and manage events of all sizes. 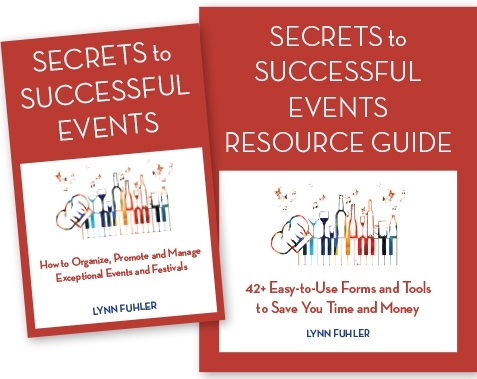 This essential handbook – Secrets to Successful Events: How to Organize, Promote and Manage Exceptional Events and Festivals – provides professors, instructors and teachers comprehensive steps on running a successful event in a logical progression. The Resource Guide – a quick-start guide to hosting and promoting any event – is a companion text. It features sample letters, contracts and forms used in key areas: sponsors, marketing, publicity, talent, volunteers, merchandise, vendors/concessions and more. Lynn Fuhler has successfully organized festivals and events throughout her career. The former tourism director of Clearwater Beach, FL, she served as chairman of the all-volunteer Clearwater Jazz Holiday, then the largest free jazz festival in the Southeast U.S. Fuhler holds a transportation, travel and tourism degree from St. Louis University’s Parks College and her firm works extensively in hospitality industry marketing. to check availability with major book distributors.